When Pulitizer-Prize-winning food writer Jonathan Gold recommends a place, smart foodies listen. After all, not only can the man write (he is the only food writer to ever win journalism’s highest honor), but he has impeccable taste. So when my hubby and I were in Los Angeles recently, we picked up a copy of LA Weekly, which Gold writes for. It happened to be its “Best of LA” issue, jam-packed with the very best food finds in this sprawling metropolis. OK, so maybe I was a little afraid as I stepped through the doors. I took a deep breath, fearing it would be like the Soup Nazi episode of “Seinfeld.” I’d order incorrectly and be tossed out, denied a taste of gelato nirvana for all time. Leo took my order himself, his wrists still bearing the remnants of some crushed red berries he’d been mixing up into gelato in the back room. He was quiet, but perfectly pleasant, dishing up my small cup ($3.75) with my choice of two flavors: pistacchio and zabaglione. I walked out of the shop, dipped the tiny spoon into the mother lode, and just stopped in my tracks. The Marsala and eggy richness came through loud and clear in the zabaglione. But it was the pistacchio that made me almost weep. It was as if Leo had taken 10 pounds of pistachios and ground them up to make this one tiny scoop of gelato. To say the flavor was intense is an understatement. Gold writes that Leo makes this flavor with especially fragrant pistachios that he smuggles in from Sicily. Let’s hope he never gets caught, because the world would be a far less pleasurable place without a gelato like this. It was without a doubt the most amazing pistachio dessert of any kind I’ve ever had. Gold definitely knows what he’s talking about. But then again, I wouldn’t expect any less from a Pulitizer-Prize-winning palate. We love a good pistachio gelato (heck, pistachio anything is yums) Do you think Sicilian pistachios are objectively better than say, Turkish pistachios? Pistachios and Gelato make my insides turn funny in a good way, just on their own. They should turn most rational Ice-cream fans completely crazy when they’re put together! Hey – thanks for the shoutout. I’m glad you liked Bulgarini’s gelato. Some days, his pistacchio makes life worth living. Mmm! 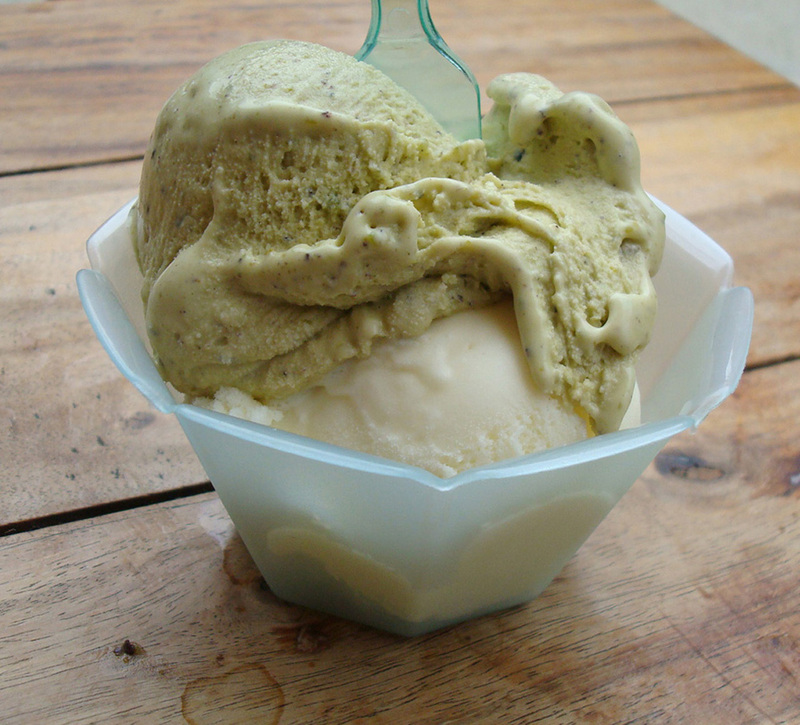 Pistachio is one of my favorite ice cream/gelato flavors! And Altadena is not too far from me. I will have to give this place a try, but I will probably be just as intimidated as you were! Wow–this sounds absolutely amazing. I haven’t done much gelato tasting in LA, but I can say that Tango gelato is San Francisco is pretty phenomenal. Though it’s actually Argentine gelato. Having lived in Italy for 4 months, I can say that good gelato..is hard to find (at least in its true Italian form). I’ve read how wonderful Argentine gelato is, so have always wanted to try it. I’ll definitely make a stop at Tango soon. Thanks for the tip!